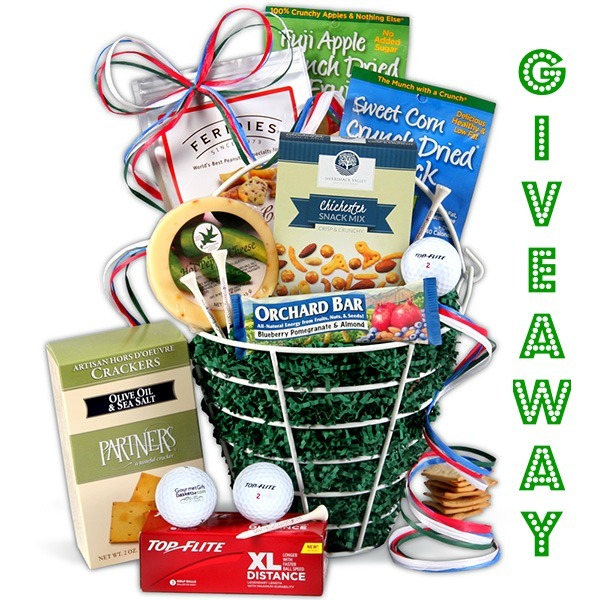 To celebrate Father's Day, the nice folks at GourmetGiftBaskets.com want to give one lucky Plain Chicken reader this amazing Hole in ONE Golf Gift Basket! If your Dad/Husband/Brother/Friend is a golfer, he will LOVE this basket! Even if he doesn't golf, he will love all the yummy snacks in the basket. GourmetGiftBaskets.com has TONS of great gourmet gifts. Beer themed gift baskets, wine themed gift baskets and even pet themed gift baskets! There is definitely something for every occasion. I absolutely love this site! It is my go-to site for gifts. · Blueberry, Pomegranate & Almond Orchard Bar by Liberty Orchards - 1.6 oz. · 5 O'Clock Crunch by Feridies - 6 oz. · Deli Style Hors D'Oeuvre Crackers by Partners - 2 oz. · Hot Pepper Cheese by Northwoods - 4 oz. · Chichester Snack Mix by Merrimack Valley Snack Company - 2 oz. Use the PromoSimple widget below to enter for a chance to win! The giveaway ends on Friday, June 10, 2016 @ 11:59PM CDT. The winner will be notified via email and has 48 hours to respond. If the winner does not respond within 48 hours, a new winner will be selected.